Curious About My Art & Books? Last year an artist and a critic collaborated to publish an article in which they analyzed this art-world language, and they dubbed it International Art English. 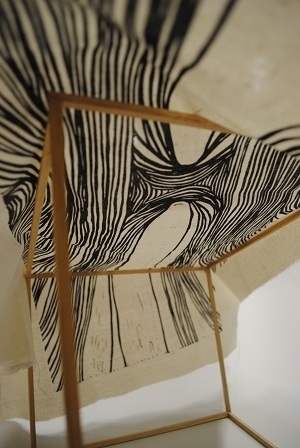 David Levine and Alix Rule explain, "IAE [International Art English] has a distinctive lexicon: aporia, radically, space, proposition, biopolitical, tension, transversal, autonomy. An artist’s work inevitably interrogates, questions, encodes, transforms, subverts, imbricates, displaces—though often it doesn’t do these things so much as it serves to, functions to, or seems to (or might seem to) do these things. IAE rebukes English for its lack of nouns: Visual becomes visuality, global becomes globality, potential becomes potentiality, experience becomes … experiencability." And "Usage of the word speculative spiked unaccountably in 2009; 2011 saw a sudden rage for rupture; transversal now seems poised to have its best year ever." They also describe "some of IAE’s essential grammatical characteristics: the frequency of adverbial phrases such as “radically questioned” and double adverbial terms such as “playfully and subversively invert.” The pairing of like terms is also essential to IAE, whether in particular parts of speech (“internal psychology and external reality”) or entire phrases. Note also the reliance on dependent clauses, one of the most distinctive features of art-related writing. IAE prescribes not only that you open with a dependent clause, but that you follow it up with as many more as possible." So, why do artists, critics, curators, gallery owners and everyone in the art world use this crazy language - or desperately attempt to emulate it? Levine and Rule call it prestige, pure and simple. It's about authority. "One could use this special language to signal the assimilation of a powerful kind of critical sensibility, one that was rigorous, politically conscious, probably university trained. In a much expanded art world this language had a job to do: consecrate certain artworks as significant, critical, and, indeed, contemporary." This language was developed and continues to be used because fluency in IAE marks the user as an insider, someone with the authority to judge what is art and what is not. It's probably needless for me to say how annoying, ridiculous, and sad I find IAE and its use as a way to distance art from people. It looks to me more like a sign of insecurity than knowledge. If you had real confidence in the power of your art, you wouldn't need to swaddle it in a protective layer of elitism to keep anyone from looking too closely. IAE seems like nothing so much as another set of fancy new clothes for the emperor. attackers are griping only because they're not in the in crowd, about whether it has any legitimate meaning at all, about whether the artwork it describes has any meaning at all… But oddly enough I haven't noticed anyone bring up what seems to me a very basic point. That is, the meaning of art is fundamentally an abstract thing and it's really hard to use words to describe something abstract. The bottom line is, no matter how hard you try to be honest, down-to-earth, or simple, it's just about impossible to write an artist statement without sounding at least a little bit silly. Even if I say exactly what I sincerely believe, when I put it in words it starts to sound pretentious. 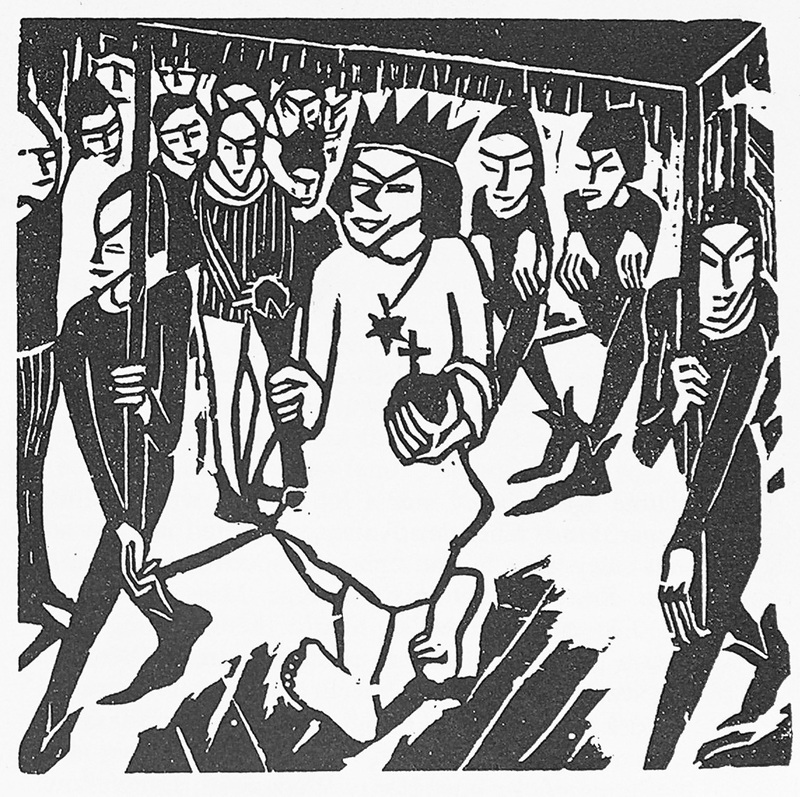 So while I decry the use of a special language to signal status and power by making art the province of an elite few, I still say, don't reject it all. Sometimes artists are trying to do more than pose or impress. Sometimes they really are trying to communicate. (Quotations from "International Art English," by Alix Rule and David Levine, from triplecanopy 7.30.12. You can read the entire article here. 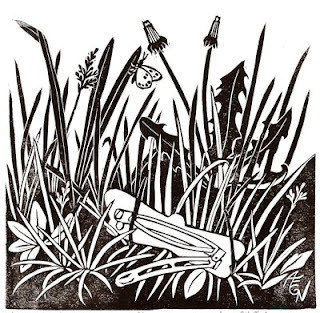 Herschel Logan (1901-1987) was a printmaker who concentrated on everyday scenes of Kansas in the 1930s. 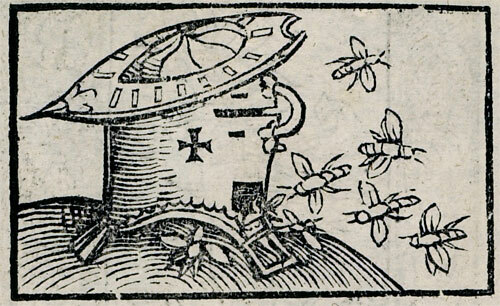 He made many woodcuts of farmhouses set among trees and fields beneath wide skies. Although he often showed the abandoned and derelict buildings that must have been symbols of the Great Depression, his images are more peaceful than political. During the time that Logan was active as a printmaker he was very prolific and popular, but he seems to have been largely forgotten by the 1950s. Or perhaps he was never more than a regional success. In any case, I think it's a shame because I find his work very pleasing. I like the balance between black and white, between solid and textured spaces. I like the buildings he portrays, both the quaint farmhouses and the occasional industrial structure. I like the style, which I see as very typical of 30's art, of framing the scene with an uncarved edge. Most of Logan's scenes are serene or quiet, but this one shows a dramatic moment. He isn't really capturing motion, since the moment is frozen in time, but he certainly captures the power and menace of the dust clouds about to swallow the farm in their path. There's nothing serene about this image. Logan has used tiny dots rather than lines for the texture and shading of the dust cloud, and an effective but unexpected touch is the use of the dots mixed in with the lines showing the sky around the clouds. Logan clearly had favorite themes he returned to over and over. Maybe he was only repeating a successful formula, or maybe he was exploring themes that were meaningful to him - no one would call him avant garde. But in any case I find these pieces very attractive. They're simple without being simplistic, with a lovely balance of light and shadow. 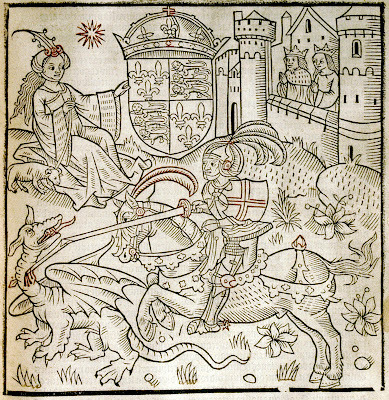 Today is St George's Day and therefore a good time to look at some depictions of the knight slaying the dragon. The story of George and the dragon follows the pattern of any number of tales from mythologies all around the ancient world. 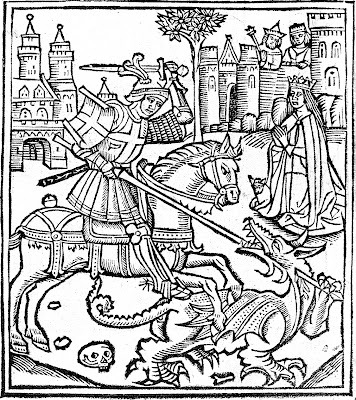 Dragon plagues population; it is to be appeased by human sacrifice; king balks when it comes time to sacrifice his child; warrior arrives to slay dragon and save the princess and the day. In George's case the story also includes the conversion of the populace to Christianity. 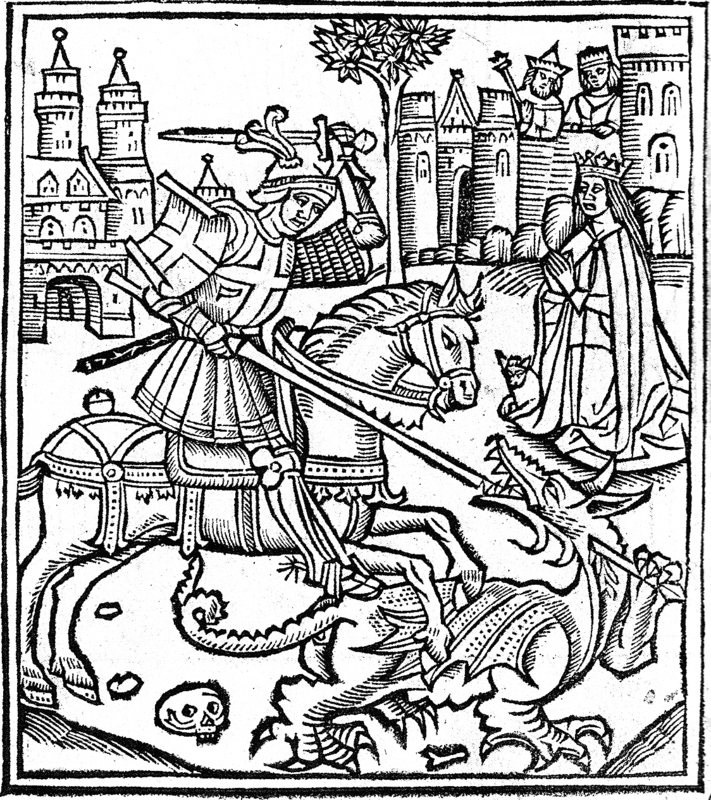 In all such stories the dragon can be seen as an allegory of some great enemy of the people in question, and in the case of St George the dragon is most often interpreted as Satan or Evil. That allegory doesn't satisfy me - I'm not much convinced by the idea of passively tolerating evil until someone else comes along and gets rid of all your evil for you after which all is spiffy. But of course I'm happy to take George and the dragon at face value as a rip-roaring fantasy tale and an excuse for some fabulous art. 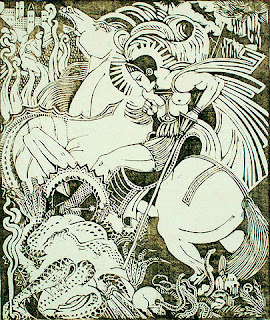 And of course of all the wonderful depictions of St George, I'm going to stick with block prints. 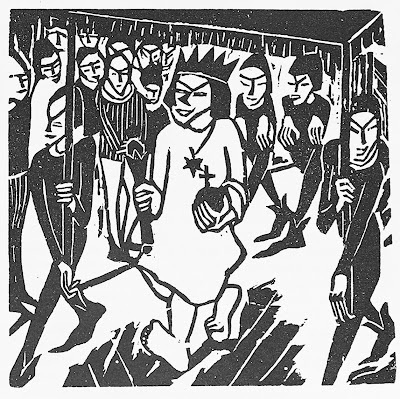 Perhaps my favorite is the first woodcut shown. This is a really great dragon! The dragon and the horse are having a fierce staredown, the dragon is wonderfully spiky, and there's a great castle and delightful tree in the background. What's not to love? 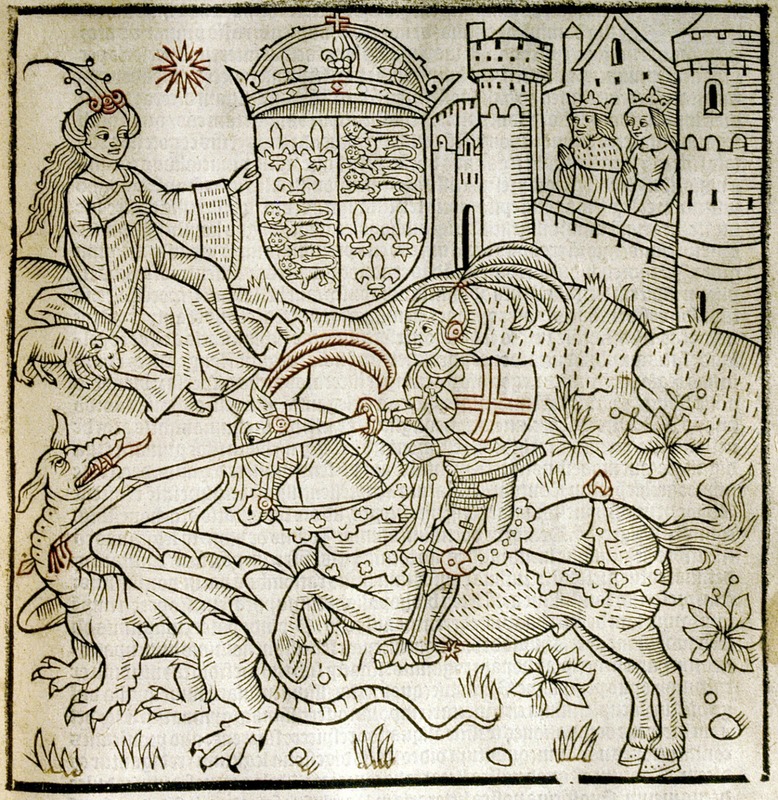 Like most depictions of St George before the Victorian era, he's shown wearing contemporary armor of the time, even though he was supposed to have been a Roman soldier. Also, as in most depictions, the dragon isn't very big - though I admit it would still be a scary thing to find lurking near your home. George is shown in vaguely Roman garb in this Art Deco effort by Henri Van der Stock, but I find it more silly-looking than anything else. Also, I don't care for the dragon, who looks so limp and scrambled that I can't even tell what's what. I guess that's what you expect in a dragon after a saint has been at it, but I still prefer my dragons a little more ramping. I include another modern St George just for variety, although I confess to having little attraction to this piece, either. George's weapon appears to be a cross between a pruning hook and a boomerang, and the dragon looks more like a plesiosaur. Not that I have any intrinsic objection to the idea of St George going up against prehistoric marine reptiles, but the more abstract style just isn't to my taste. Still, I like the use of the white hatchmarks and the darker blue shading on the horse and knight. So here's another Renaissance St George, this time with the technicolor addition of red ink , the better to depict George's famous red cross and, of course, the dragon's gruesome tongue and blood. The princess is actually rather pleasant-looking, and I like the huge flowers in the meadow and the horse's fancy trappings. The dragon's left hind foot is especially excellent - I can picture the terrifying footprints it would have been leaving around the stream. Since I generally find dragons more interesting than dragon-slayers I have a tendency to cheer for the dragon. 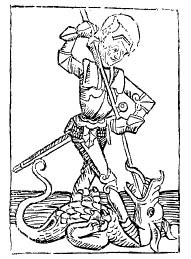 But St George is a good reminder that the important point is to stand up to monsters in whatever form they come. 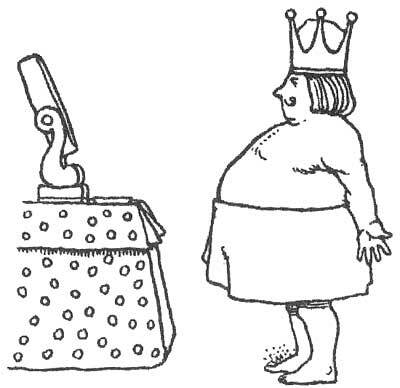 As G.K. Chesterton said, "Fairy Tales are more than true; not because they tell us that dragons exist, but because they tell us that dragons can be beaten." too. Besides, Monday is Earth Day, also a time to celebrate resilience and new growth. 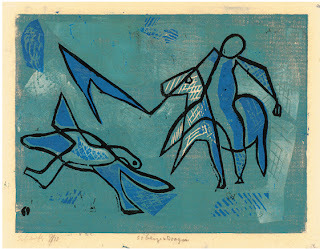 Here are a few block prints that cheered me. 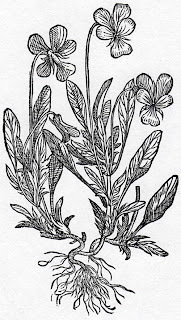 First are two illustrations of the same theme. 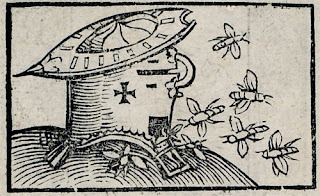 They represent helmets being used as beehives. You might think this is supposed to show the idiom "bees in his bonnet," but in fact it's a variant of the "swords into plowshares" idea. 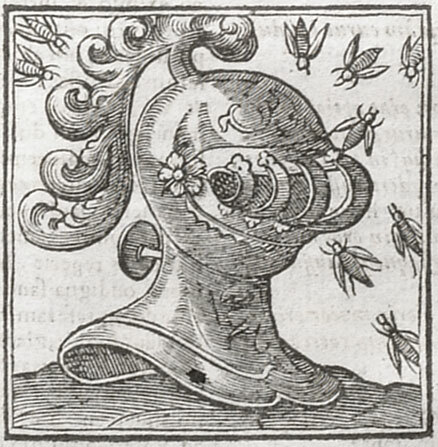 I hadn't heard the proverb before and I don't know whether a metal helmet would actually make a good hive, but I like the concept of turning tools of war into tools of peace. I always like the reminder that just because we're surrounded by violence now, it doesn't mean we can't change, put that mindset behind us, and move on into peace. And I also wanted to include this simple, small block print that seems perfect for both Earth Day and my hope that we can overcome the fears that keep us hurting one another. 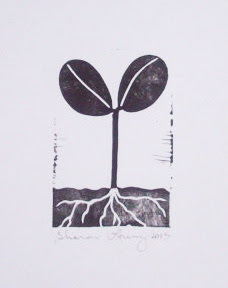 Remember that seeds keep sprouting and life keeps coming back. 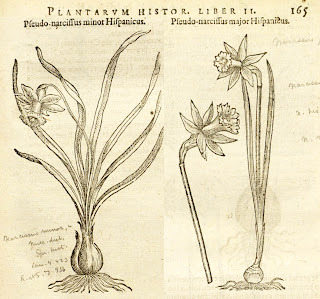 Looking for something-or-other on the web a while ago I came across the mention of a museum exhibition that I had no opportunity to see, but which sounded pretty cool. 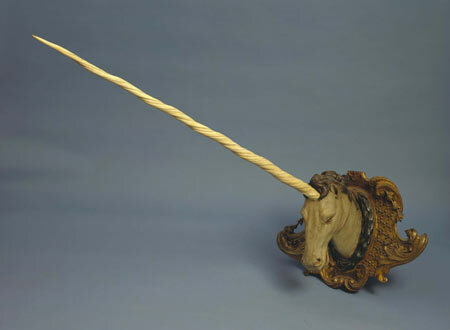 The idea was the history and science behind legends of mythical creatures. On the one hand, it was a little frustrating to be notified of something I couldn't do! On the other hand, I poked around and found lots of interesting information associated with the show still available. 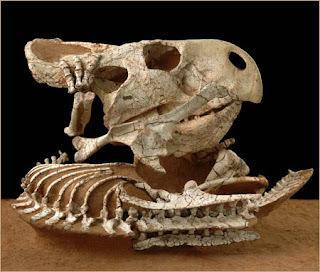 Here are a number of links with information about mythical creatures, the history of how such legends might have arisen, the scientific truths that might have contributed to them, and some historical excerpts and images. There isn't anything terribly in-depth here, but there are lots of good tidbits that might whet your appetite and get you started on a search for more. "Mythic Creatures" exhibition home page from the Field Museum - click through to find the photo gallery, as well as sections on dragons, and creatures of water, land, and air. The American Museum of Natural History's page for their version of the exhibition - I think this is all the same information, but with slightly different navigation and a better set of photo galleries. "World Myths & Legends in Art," by the Minneapolis Institute of Arts - an unrelated web exhibit without the emphasis on creatures, but some beautiful art and interesting takes on mythology. Yesterday T came home from school with a little viola plant she'd found growing in a crack in the sidewalk. She'd carefully gathered up its roots with it, and it looked just like this charming little botanical woodcut. Although it sat in T's backpack all the way through cello lesson, homework, and dinner, we gave it plenty of water overnight and it perked right back up. I guess that's why they call them Johnny jump-ups. 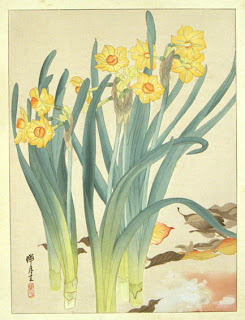 It's also daffodil time here, which is always cause for celebration. 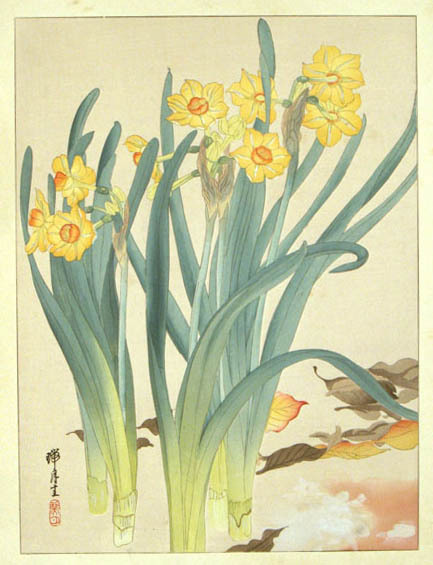 The miniatures are already out, and the first of the larger yellow daffodils are cheerfully smiling into today's dismal April showers. 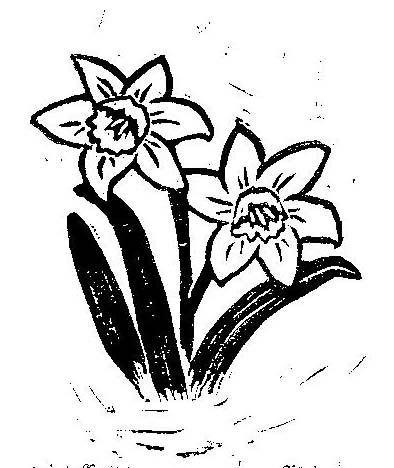 In celebration of daffodils, therefore, here is a collection of block prints of one of my very favorite flowers. The lime scale remover is a case in point. I was in a mall many years ago when I was approached by one of those people with clipboards and asked if I would take part in a survey. "Why not," I thought. I had nowhere to be and I'd never done anything of the sort before. It could be interesting. So the woman took me into a back room and proceeded for the next twenty minutes or so to press me for my deep and heart-felt passions on the topic of lime scale remover. I'd never even heard of lime scale before, and had no feelings on the topic whatsoever. This was when I realized just how boring a subject lime scale remover intrinsically is. But the over-all experience was, indeed, kind of interesting. It made me wonder about all sorts of things: that this is how decisions get made about what products I'll have the option of purchasing, the creative and moral implications of advertising, that some people out there actually do care passionately about lime scale and its removal, and what makes those people tick, that there are these little cubicle offices behind the scenes at the mall that I'd never seen before, and how every place I go and everything I do is really made possible by little back rooms that I never see. And that's actually really interesting stuff. I love having the veil drawn back to see what goes into the things I take for granted. For art this awareness may be primarily visual - to notice the interesting patterns or curves all around, in the natural and the human-made, in the unusual and the everyday. For writing the awareness must encompass conversations, situations, all sorts of human interactions, the emotions in myself, smells, tastes, and all kinds of sensations, as well as the visual. But whether as an artist or a writer, I always try to remind myself to be aware of those elements of life that are interesting, surprising, and unexpected, and that simultaneously ring absolutely true. And the wonderful thing about art and writing is that every time I find some treasure of truth, I can simultaneously keep it for myself and set about to share it with everyone else. An endothermic quadruped, carnivorous by nature. Contribute to your hunting skills and natural defenses. For a rhythmic stroking of your fur to demonstrate affection. You would not be so agile if you lacked its counterbalance. If often serves to illustrate the state of your emotion. Connote a fairly well-developed cognitive array. I nonetheless consider you a true and valued friend. If you recall, last week I had carved and printed the first layer of my reduction print, and begun to carve the second layer. 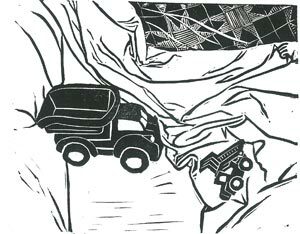 In some ways that second round of carving was the most comfortable, because this is where I put in many of the lines that I would have done had this been a single-layer black-and-white print: outlines, textures, divisions between one thing and the next, etc. On the other hand, I also chopped out whole plants where I wanted them to remain light green, which felt a little alarming. I also discovered a few areas that should have been carved out in the first round, but which I didn't see then because it's not supposed to look finished in the first round anyway. And of course by the time you're carving the second layer it's too late to go back and fix the first. I was able to change the design in the second round to disguise one "mistake," and I trust the other area will just be put down to a lush confusion of leaves in the background! Printing the second layer of ink, dark green this time, is where the registration starts to matter. If the two layers don't line up reasonably closely, the design looks blurred and off. I went ahead and printed the second color on 15 of the 18 first color sheets, even though many of them hadn't looked too good after the first round. To my relief some of them actually looked better now than before, when the second layer of ink covered errors in the first layer. But five more of them were deemed unfit for the third round. And then it was time to carve the final reduction. 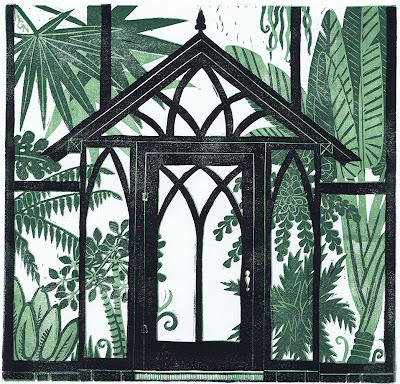 This time I hacked and slashed away every plant, like a logger in the rain forest, leaving only the stark, empty frame of the greenhouse. This was the easiest and quickest round of carving, but… Yikes! Of course there's the washing and drying of the block before and after every printing run, and what with one thing and another I didn't get around to printing the final color of ink (black) until yesterday. I must say I was quite pleased with how the black frame made the image pop. I was surprised that it also seemed to forgive some of the imperfect registration between the first two layers of ink. All the same, I ended up keeping only 7 for my final edition, and of those I'd say only two were anywhere close to "perfect." Nevertheless, here it is: the finished three-layer reduction print, The Greenhouse Door. I am a writer, an artist, a stay-at-home-mother, and a negligent housekeeper. There's more of my biography in the first post. 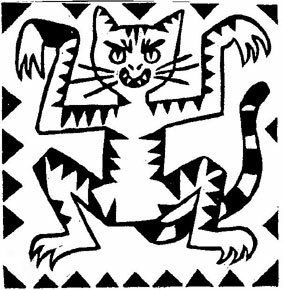 See the Curious About My Art & Books page for links to several web sites where you can find my block prints and books, or just go here. Copyright 2010 Anne E.G. Nydam. Do not alter or copy words or images without written permission. Simple theme. Theme images by enjoynz. Powered by Blogger.